Metcalfe and Wolf sparred over the data after Metcalfe made a right-to-know request under state law which the Wolf administration objected to - going to court to try and keep it hidden from the public. The state Commonwealth Court appellate panel scheduled a hearing last month to address the issue, however one week before the hearing the Wolf administration withdrew their appeal and announced that they would turn over the information. Metcalfe questioned the Wolf administration's timing. "This governor has been an obstructionist in revealing this information to the citizens, and thereby I believe a participant in allowing this fraudulent activity to occur because it benefits him and his party," he said. Days earlier, Texas Attorney General Ken Paxton's office announced that the Texas Department of Public Safety identified nearly 100,000 noncitizens on the state's voter rolls, according to NBCDFW. Texas officials arrived at their conclusion after comparing state driver's license records - which note immigration status - with voter rolls, and found that 95,000 people registered as noncitizens were among the 16 million registered to vote in the state. Of the 95,000 - around 58,000 had voted at some point since 1996. Pennsylvania officials arrived at their figures in a somewhat similar process - admitting that a glitch in the state DMV computers allowed noncitizens to register to vote. "Demonstrating, much less discussing, noncitizen voting activity is the worst form of heresy one can commit for left-wing groups," said Public Interest Legal Foundation director Logan Churchwell, whose group is involved in Texas and Pennsylvania lawsuits to obtain voter data. 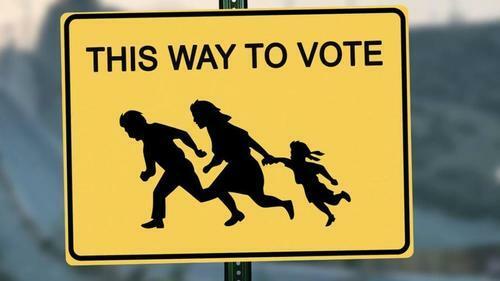 Judicial Watch president Tom Fitton told the Times that these reports are "the tip of the iceberg," adding "This shows the urgent need for citizenship verification for voting. The Department of Justice should follow up with a national investigation." There is currently no requirement to prove citizenship to vote in any state, and efforts to change that have failed. Last year, a US District Court Judge struck down a law spearheaded by former Kansas Secretary of State Kris Kobach which would require citizenship documentation. The ruling was appealed to the 10th US Circuit Court of Appeals. That said, Texas will begin implementing certain verification steps on the back-end. Each month the secretary of state will compare new voter registrations with federal immigration records at the Department of Homeland Security. "This carries the benefit of being a report plus a reform," said Churchwell. "This wasn’t a one-off research project. Texas will be actively screening for existing potential noncitizen registrants on a monthly basis, which is something we’ve long pushed for." Liberal groups have challenged the findings - suggesting that the DMV information could be out of date. President Trump sparked a national debate after he claimed in 2017 that "millions and millions" of people voted illegally. A presidential commission was assembled to investigate, however it was disbanded after uncooperative states refused to hand over voter data and administrative issues.